Room divider screens are a wonderful way to break up large areas of office space into smaller functional zones. It doesn’t matter if your business is small or large, and it doesn’t matter what industry you’re in. Using room divider screens is a solution guaranteed to enhance your work area and offer the space necessary for a functional office. Oftentimes, an office’s filing area can get out of hand very quickly, especially if there isn’t adequate storage for all those files. Whereas having sufficient storage for the files is something different altogether, a room divider screen can help give form to the filing area, as well as contain the information while restoring a sense of visual order to your office. On top of giving your filing area its own dedicated space, a room divider screen also adds a unique, stylish touch to your office. 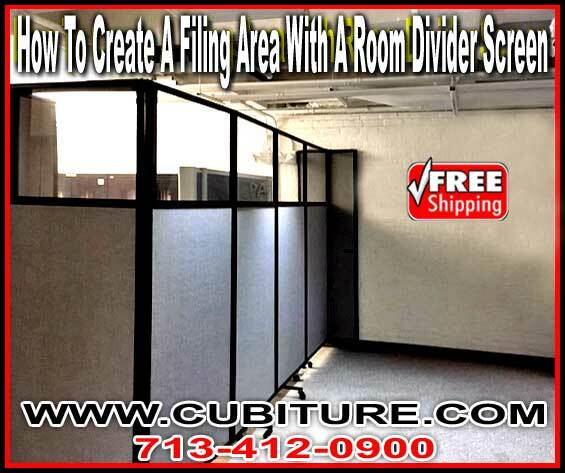 They come in many assorted colors, so you’re sure to find a room divider screen that clicks with the design and feel of your office space. If made of any number of fabric options available, you could also use the screen to improve the acoustical quality of your space, such as during a conference or any other kind of collaboration with coworkers. The sound-dampening, echo-decreasing nature of the fabric will make it easier to comprehend speech and block unwanted noise if focus is needed while perusing files. These panels also accept push pins so that you can make your room divider screen even more functional as a bulletin board. Acrylic windows at the top of the panels are available, allowing light to come through and further helping with the visual task of searching for the files you need and looking through them. Lockable casters can also make your dividers portable, giving your filing area the freedom to take shape how it needs as it expands. However, wall-mounted options exist also if your filing area isn’t looking to relocate any time soon. For a more modern look, you can opt for one of our polycarbonate room divider screens, also in a variety of colors. Multiple opacities are possible, depending on how much visibility you want there to be. These polycarbonate room divider screens are easy to clean with a simple cleaning spray. They are also lightweight yet highly durable and shock-absorbent also. You can choose from several heights from four feet to seven and a half feet, along with several panel widths. Though room divider screens are the perfect economical choice for creating new spaces, there are even more budget-conscious products among them. We have portable canvas partitions that give you a lower price point while still sharing many advantages with our costlier partitions. This includes a unique 360º hinge that gives your panels full range of movement and ultimately allow for quite a few dividing arrangements, including in a an “L” shape or in a “C” shape, or in a large graceful curve. Just like our polycarbonate, the canvas used in these room divider screens durable yet light in weight, which is a plus for when you are repeatedly storing them away and bringing them back out. If you feel it’s necessary to create a space for your filing area, look no further and contact Cubiture. We can help find room divider screens that work within your budget while also working with your office space. Call us today!